Having spent a couple of weeks in the exiled world of Arborea in the delicate boots of a pretty pink Sorcerer, for my second MMO log I decided to take the long, strange trip to mid-level madness in something a little more sturdy. Well, not too sturdy. My High Elf fixation continues, but instead of the flimsy robe of a caster, Center here dons full plate armor and wields an axe the size of a small car. He's still pretty though, which is what really counts. Levels one through thirty in En Masse Entertainment's massively multiplayer online fantasy game are a relatively linear affair. You spend the first twelve or so on the starter island. After a brief trip to the gorgeous city of Velika it's off to Lumbertown, where a series of quests will carry you from zone to zone up into your mid-twenties. Then it's off to Popolion to fight the undead. After that things open up a bit, giving the player some choice in which zones to play through and which to skip, but those first thirty-or-so levels are pretty much set in stone. That can be a problem. There's a line of thought that in order for a player to get the most out of an MMO they should level a character of every class available. When the first twenty hours of content are exactly the same, a game's got to do something to keep the experience fresh. Tera handles this issue better than most, once again thanks to its dynamic combat system. Center is a Berserker, a profession with the same general damage role as a Sorcerer, but a much different way of going about it. 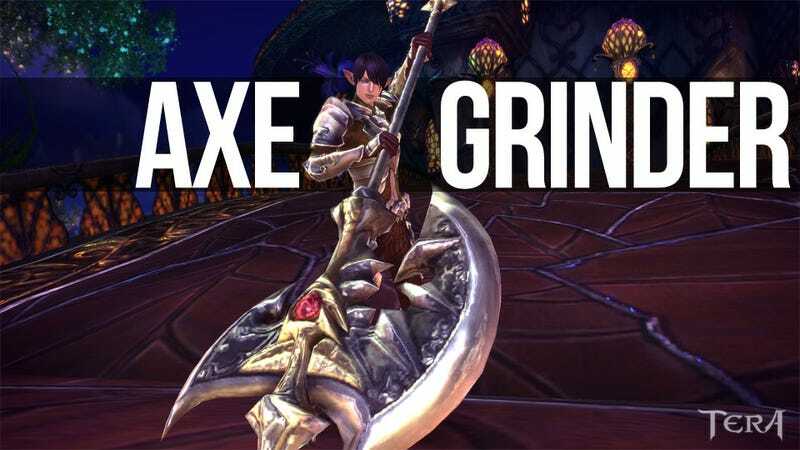 Rather than staying at a distance and doing as much harm to the enemy as possible, the Berserker wades in axe swinging. When the enemy attacks he blocks, blows glancing off him as he waits for an opening. There's a great deal of timing involved, but when I get it just right even the most threatening creatures cannot touch me. So as I progressed through some 35 levels as Center I reveled in this new type of combat. It was much different than simply having a different set of icons on my hot bar. It was an entirely new experience. As a Berserker my role is in the middle of the fray (hence the name), standing off to the side and trying not to steal aggro from the tank. Despite being the class other than the Lancer that can wear metal armor, the Berserker doesn't have abilities dedicated to keeping a creature's attention while others are pounding on it with spells and swords. This goes against everything MMOs have taught me up to now. The metal guy is the tank, the leather guy is damage, and the guy in cloth needs to stop casting so hard. Over the past week I've been asked to act as a groups tank at least a dozen times. There was a lot of dying involved. Last week I said that the Lancer, with its massive shield and tree trunk-sized weapon, was the only viable tank class in Tera. Perhaps I should have said it was the only easy tank class. The dual-sword wielding Warrior is a tank class as well, but it takes an extremely good player to pull it off. Rather than being able to soak up damage, the leather-clad Warrior is about dodging, weaving, and generally annoying the hell out of enemies in order to keep them from eating the guy casting healing spells. I've run instances with several Warrior tanks over the past week, and quite a few of them did a damn fine job, despite having a member of their party actively attempting to steal aggro to see if it could be done. Sorry, Warrior friends. I'll be better next time. The game's visuals continue to impress, and every day I'm discovering new lands to explore and new creatures that slice to bits using my Final Fantasy-sized wood-chopping device. I put together a little video of the game's travel system to demonstrate both the range of Tera's scenery and the fact that the magical flying horses have no anuses. So now I have an alt, but I like to think of him as my other main. While I am occupied with Blizzard's latest, Center sits waiting at level 35, while Back the Sorcerer accumulates rest experience for the big push towards level 48. Next week I'll definitely take a look at crafting, and with the first elections coming up I might be able to offer a little insight into the political process. Unless I make another alt, that is.